The Compton was originally installed in the Queens Hall Cinema in Grimsby in 1935, at a cost of approximately £6000 and Reginald Dixon from the Tower Ballroom, Blackpool opened it in that year. 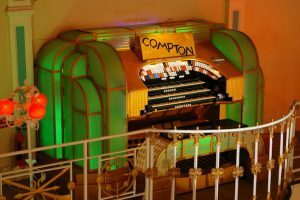 It was the first Cinema Organ in the area, being followed in 1936 with the Compton in the Regal, Grimsby and in 1937 by a further Compton in the Ritz, Cleethorpes. When installed it was a 2 manual, 5 rank organ, the ranks being Tibia, Trumpet, Tuba, Flute and Violin-Cello. The organ was installed at the side of the stage area and played through the screen and curtains. One of the first resident organists was W. Henson Maw and another famous theatre organist, Noel Briggs, taught himself to play the theatre organ on this instrument when he was the junior projectionist at the Cinema. The North Lincolnshire Theatre Organ Preservation Society was formed in 1970 and the organ was purchased by the Society in 1972 as scrap, the console and pedal board having been destroyed by water during the east coast floods of the 1950’s. A replacement console was purchased from the Savoy Leyton – a very early Compton with a serial number of 4 dating from 1928. The illuminated surround came from the Wurlitzer of the Ritz, Huddersfield, one of the few Wurlitzers with an illuminated surround and the only one with an illuminated seat. Having been stored in members’ houses, gardens and garages, it all came together at Louth in 1975. The Louth Borough Council altered the balcony and built the Organ Chamber at a cost of £1900, the rest being given by the Society. The Compton took a year to install, working on Sundays and Monday evenings and was finally played in public at a dance in October 1975, followed by a dance in the November and a concert in the December played by Arnold Loxam who played every Christmas concert for many years. This was celebrated in December 2000, which marked 25 years since it was installed and also Arnold’s 25th Christmas Concert. When the organ was completed it was handed over to the East Lindsey District Council, but the Society are still responsible for its upkeep and maintenance, so to enable them to achieve this they run nine concerts a year from September to May featuring the country’s top organists. Since the Compton has been installed it has been enlarged by the addition of five further ranks: a Diapason from the Gaumont, Derby; a Vox Humana from the Carlton, Essex Road; Clarinet & Krumet ranks from the Regal, Canterbury; a Diaphone from the Gaumont, Derby and a String Celeste from the New Victoria, London. This brings the specification to 10 ranks. In the summer of 2005, the console was changed for a more modern one (1936) which was removed from the Ritz Cinema, Barrow in Furness in 1965 and was in storage for 40 years until being brought to the Town Hall. It is interesting to note that the Organ has now been playing longer in the Town Hall than in its original Cinema home.